Since my mid 30’s, I have dealt with early onset arthritis, and over the years, got used to managing the occasional discomfort, aches and pains. I switched to more comfortable and supportive shoes, wore support hose, and did my best to keep moving, even on days when it wasn’t the easiest thing to do. Early on I tried medications to assist-none did any better than acetaminophen or ibuprofen, and quite frankly, I even had to cut back on them because of gastric issues. These past several months, however, a deep intense ache has plagued me, primarily in my hips, legs and feet, though the aches in my wrists and hands has increased as well. I struggle managing it some days, today is one of those days. I only take my OTC mix a couple of times a day to avoid the aforesaid gastric troubles, but I have added a half dose of a muscle relaxer a couple of times a day to give that a little boost, and to keep the pain at a more manageable level. Try, anyway. More and more frequently, I find myself suddenly dealing with an 8, 9 or 10 on the pain scale, unable to take enough of the edge off, in tears to find some sort of release. And, before you suggest it, yes, I’ll be contacting my physician to see what’s going on, but honestly, I have little hope for relief, knowing my previous responses to medications, and knowing I don’t want to have anything to do with certain medications because of their VERY worrisome side effects. So-where does that leave me, and what does that have to do with my love of fiber? This is what connects them: when there is nothing more I can do medically, I can pick up some fiber and a felting needle and stab something into existence. I can find a soft and comforting yarn and my crochet hook and exercise my hands while I feel the luxurious strands running through my fingers. I can sort through my felted wool, searching for just the right touch for a project, and take in the colors, the textures, and momentarily lose myself in the fiber, giving my mind, at least, a brief break from a 10 pain day. Fiber helps to pull my head away from the pains in my body, helps me to find a focal point away from the intensity of the aches. And for that, today, I am grateful. That amazing length of fiber, so brilliantly colored, was the beginning of my journey with felt. If you want to give this ‘fiber’ thing a try, then I encourage you to check out the dates of my upcoming classes in the previous post and sign up for a class. Who knows? You may just begin your own love affair with fiber! Now go stab something into existence! FEBRUARY IS BUSTING WITH CLASSES! Give yourself the gift of a set of wool dryer balls (2) and get away from chemicals to dry and soften your laundry. With a needle felted beginning, these dryer balls will be ready for you to throw into a hot wash when you get home, and will be much easier to remove from the nylon covering. During the first class, you’ll needle felt your self lined bag on a closed cell foam block. At the second class, handle and closure options will be discussed, and you’ll embellish your bag with additional needlefelting, buttons and beads. 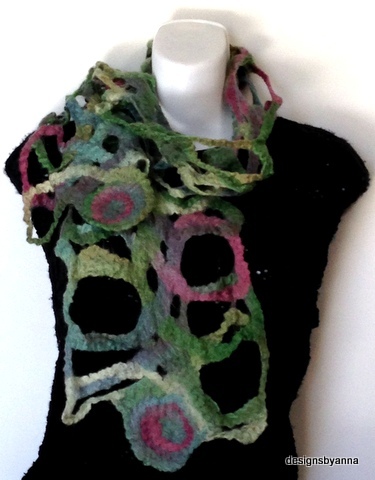 Learn the basics of wet felting as you create an open, lacy lattice design all-season scarf. 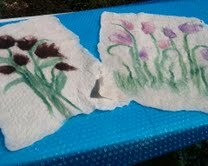 You’ll have the opportunity to work with a number of tools while learning the techniques of wet felting.